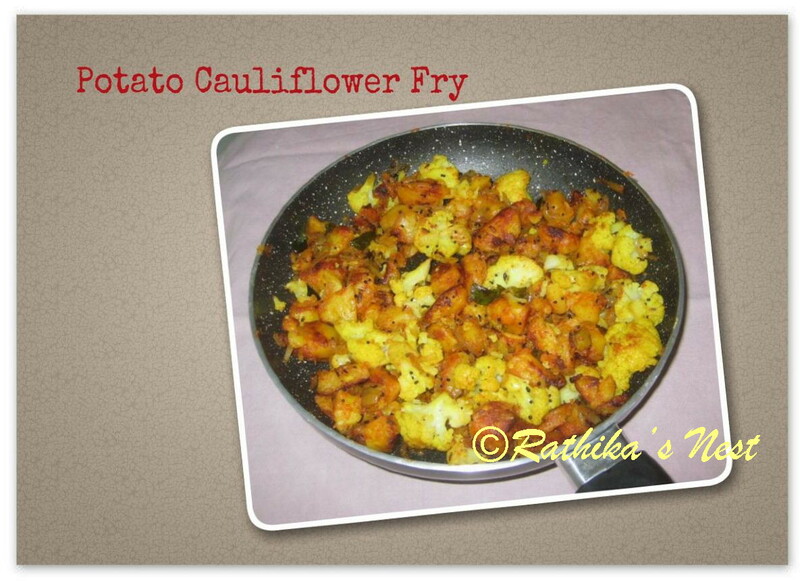 Potato and cauliflower complement each other while making a curry or gravy. This dry curry made with potato and cauliflower goes well with chapattis and steamed rice alike. As the cooking time for these two vegetables differs, I prefer to cook them separately and finally mix them together. I find this method offers better results especially for dry curry. Please try this Aloo-Gobi recipe. Method: Pressure cook potatoes for 5 minutes or 5 whistles; cool under running water; peel and cube them. Add required salt, ½ teaspoon turmeric powder and chili powder. Mix well. Heat 1 tablespoon of oil in a sauce pan; add the potato pieces and fry on low flame stirring every now and then till they become golden brown in color. Mean while, separate the cauliflower florets; wash well, drain and keep aside. Heat oil in another kadai; add mustard and cumin seeds and when they start to crackle add sliced onion. Sauté till the onion pieces become light brown in color. Add cauliflower florets, salt, ½ teaspoon turmeric powder and pepper powder. Cover and cook on low flame till the vegetable is done. Now transfer the cauliflower to the saucepan and mix gently with the fried potato pieces. Garnish with curry leaves. Simmer for 2–3 minutes and then, switch off the stove. Serve hot with rice or chapatti.